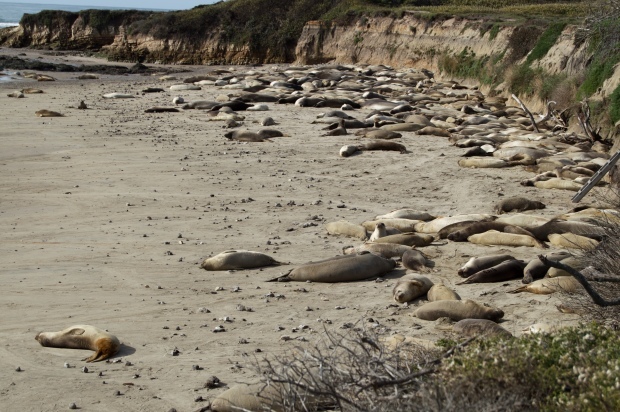 Seals are beginning to arrive at Año Nuevo State Park in Pescadero for the annual mating season and the viewing areas will be closed for two weeks to allow the seals privacy from year-round visitors. The 300 young seals currently on the grounds will be joined by thousands of adult seals in the coming weeks. While the beach and other areas of the park will remain open during the start of the season, those interested in visiting the seal colony should visit before Dec. 1 or schedule a guided tour after Dec. 15. Currently, the viewing areas are free with a $10 park admission, but between Dec. 15 and March 31, the daily guided tours will cost visitors an additional $7. Tours are led by trained docents and park rangers for the safety of the seals and visitors. While the bull seals are not aggressive to humans, according to the park, they can weigh between four to 5,000 pounds and will not alter route when pursuing female seals for mating. The most activity during the season will occur in mid-January, according to Año Nuevo State Park. During that period, Equal Access tours offering ADA or other accomodations can be made for Fridays through Sundays or on holidays.